The Nylatron range is adapted from the Dotmar EPP thermoplastics family. Self-lubricating Nylatron MC901 is suitable for applications where there are large open gears in operation, mainly cast iron or steel gears that are open to the atmosphere. Nylatron gears do not have exposed lubricant; their lubricants are built into the material from which the gears are made. Thus, Nylatron does not allow dust, dirt and grime onto any of the moving parts. The grime can act as a grinding paste, damaging gears and decreasing their longevity. The gears engineered from Nylatron MC901 also contain a built-in heat stabiliser. This permits longer usage in temperatures of up to 120°C, as well as low noise output, superior fatigue resistance and dimensional stability. The use of Nylatron MC901 in such type of application means the life span of gears may be up to five times longer than the metal compound. 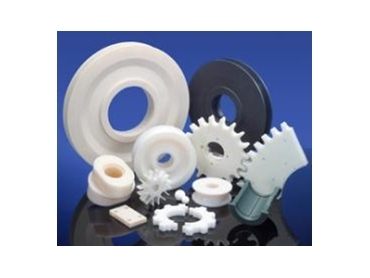 In addition, impact resistance of Nylatron MC901 compared with metallic gears translates into an improved tolerance to misalignment, as well as higher resilience. Benefits include much lower levels of vibration transmitted to the bearings. Dotmar EPP's extensive range of the Nylatron series are complemented by high performance nylons in the Ertalon series and are part of Australasia's most comprehensive range of machined and semi-finished engineering thermoplastics and components. The advantages of nylons include sliding properties, wear resistance, vibration dampening, impact strength, light weight and good machinability have all led to designing and manufacturing highly loaded components in cast nylons for both OEM and maintenance work.